Assam Secretariat Recruitment for 167 Nos. Computer Operator Posts: Last Date 19-09-2017. - Jobs4NE : Jobs in Assam and North East India. 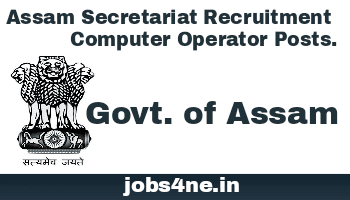 Assam Secretariat Recruitment for 167 Nos. Computer Operator Posts: Last Date 19-09-2017. Online applications are invited from Indian citizens as defined in the Constitution of India having registration in Employment Exchanges in the State of Assam for recruitment of Computer Operator for the Assam Secretariat, Government of Assam, Janata Bhawan, Dispur, Guwahati-781006. Starting date of online application: 21-08-2017. Last date of online application: 19-09-2017. Total no of posts: 167 Nos. (UR- 91, STP- 19, STH- 9, SC- 8, OBC/ MOBC- 32, PWD- 8). a) English Language Computer Operator: 114 Nos. b) Assamese Language Computer Operator: 53 Nos. Age Limit: As on 01-01-2017, 18 to 43 years of age. The upper age relaxation for SC/ ST candidates is 5 years. Scale of pay: Rs.14000- 49000/- + GP Rs. 6200/- + Allowances. Application Fee: The amount may be paid through Treasury Challan to the Head of Account “0070-Other Administrative Services-60-Other Services-800-Other Receipts. a) For General candidates: Rs.250/- only. b) For SC/ ST/ OBC candidates: Rs.150/- only. c) Candidates having BPL Certificate: Nil. Examination Zone: For Phase-I; Silchar, Diphu, Haflong, Dibrughar, Jorhat, Majuli, Nagaon, Lakhimpur, Tezpur, Mangaldai, Guwahati, Nalbari, Bongaigaon, Kokrajhar and Dhubri. How to Apply: Candidates can apply in prescribed form through online mode only on or before last date. Instructions for filling up prescribed online form will be available in website: www.recruitmentaim.in.